The dish itself is worthy of any menu in a well-established restaurant in Ireland, but myself and my team at Mount Falcon decided to include it on TheTaste.ie as you can take apart the dish and the methods used so you can create other dishes to develop your skills in simply cooking fish at home. The methods used are very easy to prepare and are classic methods of cooking fish while keeping the textures soft and full of natural flavour. Add the zest to the cucumber liquid then warm it while soaking your gelatine leaf in water till soft. Add the soft gelatine to the warm cucumber liquid (don’t boil) and stir till completely dissolved. Add the gin and set the mix in any mould you desire or on a tray so you can cut out pieces. Combine and soak cucumber pieces for 8 hours, dry and serve. Combine all ingredients, place your mackerel in the marinade and leave in the fridge for 6 to 8 hours. When plating the ceviche simply dry and serve. Combine all ingredients and rub over the fillet of mackerel and leave for 8 hours. Wash thoroughly, dry and serve. A delightful example of Albariño, it has a lovely fresh nose of lemons, limes, pears and almonds, with a delicate floral note. On the palate, the lovely citrus aromas flow onto the palate with some honeydew melon, pear and yellow apple notes. This wine will pair well with the mackerel ceviche, the round supple body will carry the weight of the meat with the fruit notes balancing the citrus tones from the marinade. Daniel Willimont is the head chef at the Luxury 4 Star hotel Mount Falcon. 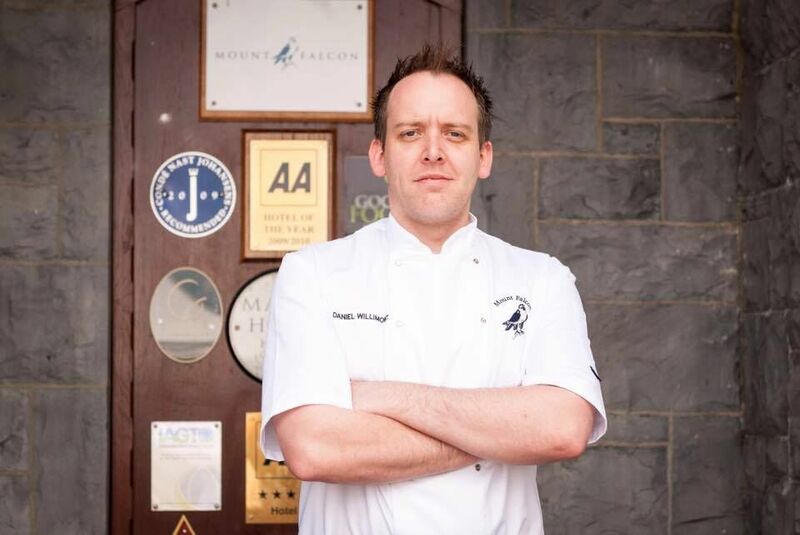 He is also the proud recipient of the 2015 Good Eating Guide’s Best Chef in Connaught award. Famous for luxurious accommodation and award winning food, Mount Falcon Estate offers rest and relaxation in many forms: indulge in the fabulous Spa & leisure centre, learn to fish on our Estate lake, catch the elusive wild Atlantic Salmon on our private stretch of the River Moy or meet our gardener and his busy bees in the Kitchen garden. Menus on offer at Mount Falcon vary with the seasons and availability of the very best of fresh local produce, and over 80% of the produce used comes straight from the kitchen garden. Mount Falcon Estate is delighted to have been awarded “Best Manor House Hotel 2015”.